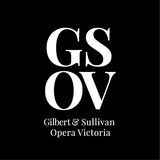 to GSOV Season 2017 It is with great pleasure that I announce Gilbert and Sullivan Opera Victoria’s 2017 Season and hope that you can join us for this exciting adventure. We have had enormous fun and success with our 2016 productions (The Gondoliers, Chu Chin Chow, and the Gilbert & Sullivan Gala Spectacular) and cannot wait to get started on the upcoming season. From the high seas of Penzance to the courts of London, there is sure to be a production to suit everyone, from committed Gilbert and Sullivan fanatics, to G&S newbies! While we have a boutique production of 'The Novello Years' in The Dandenong Ranges in February, we open the main stage year with ‘Iolanthe’ in May, where sweet yet mischievous fairies will undoubtedly cause trouble in the mortal realm. This is followed by ‘A Song to Sing O!’ in July, which will be a rare treat for G&S enthusiasts. Our season will conclude with the swashbuckling and ever popular ‘The Pirates of Penzance’ in late October. Whilst we are able to put on some incredibly professional productions, utilising large casts, costumes, and full orchestras; we need YOUR help in order for us to continue the calibre of shows presented and keep the G&S tradition enduring for another 80 years. It is with great excitement that I announce and launch the 2017 Subscription Packages which have been designed and created to ensure that YOU get the best deals, experience the best opportunities and involve yourself in one of the best light opera companies in Australia. I look forward to welcoming you all to the Gilbert & Sullivan Opera Victoria. There is a Subscription Package to suit everyone, and I may add that a Subscription would make a rather wonderful gift! I thank you for all your support in 2016, and look forward to a wonderful 2017 ahead! Darebin Arts & Entertainment Centre Cnr Bell Street & St Georges Road, Preston VIC 3072 Box Office: (03) 8470 8282 Tickets Adult: $39 Concession: $33 Student: $25 Child (Under 16): $20 Group 10+ $32 Matinee: One free child when accompanied by full price adult. Relax and revel this summer with our boutique production featuring the glorious music of Ivor Novello. Playwright, composer and popular matinee idol actor, Novello had a remarkable career spanning close to forty years. His first big success, “Keep the Home Fires Burning” cheered Britain ahead of the First World War. “We’ll Gather Lilacs (in the Spring Again)” a wartime waltz, was written for troops in the Second World War. GSOV Director Robert Ray revives a showcase of songs from the golden era of the British stage musical. Enjoy a complimentary glass of champagne as you wander an elegant English garden in Melbourne’s leafy Dandenong Ranges. 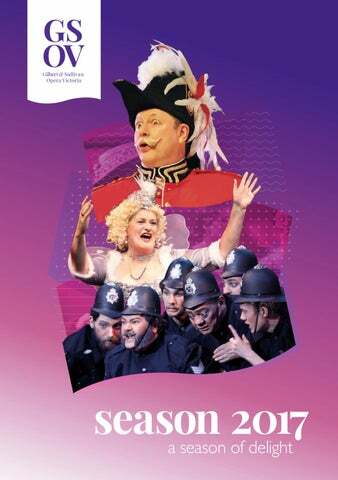 26th - 29th Oct 2017 With the Gilbert & Sullivan Opera Victoria Orchestra 5 Performances Running time approx 2hrs 30mins Thursday 26th October 8:00pm Friday 27th October 8:00pm Saturday 28th October 2:00pm Saturday 28th October 8:00pm Sunday 29th October 3:00pm Darebin Arts & Entertainment Centre Cnr Bell Street & St Georges Road, Preston VIC 3072 Box Office: (03) 8470 8282 Tickets Adult: $39 Concession: $33 Student: $25 Child (Under 16): $20 Group 10+ $32 Matinee: One free child when accompanied by full price adult. Subscription Packages We're excited to introduce our GSOV Season 2017 Subscription Packages, they represent the best value for money, saving you over 33% with tickets to all 4 shows. GSOV recieves no public funding, so Subscriptions are an essential part in helping to keep our organisation operating. Add a little drama into the life of someone special with a subscription to our delightful season. Visit www.gsov.org.au/subscribe to find out more or contact our Ticket Secretary on 0490 465 009. Support GSOV We are currently broadening our reach through a revitalisation program to further engage audiences, performers, volunteers and the community. A lot of work goes into creating our shows, which simply would not be possible without our dedicated team of volunteers. We welcome you to get involved and join in this rewarding theatrical experience, whether it be in the spotlight, behind the scenes as part of our crew or through sponsorships. There are opportunities to learn and contribute to direction, production, costume, set construction, front of house, promotions, marketing, fundraising and community outreach. GSOV's 2017 season brochure plus subscriber benefits.